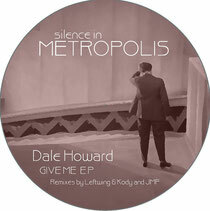 Brand new US based house label Silence in Metropolis launches with a single from Dale Howard backed with remixes from Leftwing & Kody and JMF. Liverpool’s Dale Howard burst onto the scene four years ago with releases on Neurotraxx, Starlight and Sleaze Records. Since then his music has found a home with labels such as Morris Audio, OFF Recordings and Noir. Now he’s joining forces with new kid on the block Silence in Metropolis, a brand new label coming from Washington DC with its sights set firmly on releasing the best in house music. The ‘Give Me EP’ opens with the original version of the title track, a bumpin’ deep house affair that marries rolling house rhythms, classic garage elements, tightly edited vocals, skittering beats and subtle keys. The original version of ‘Give Me’ is backed with a remix from OFF and ALiVE artists Leftwing & Kody who deliver a garage flavoured remix complete with high strings, percussive organ stabs and old school bassline. The second of the two originals, ‘Get You’, again journeys into deep house / garage crossover territory with a ‘90s feel fuelled by soulful vocal parts, shuffling drums and hooks. The remix duties this time fall to JMF, a producer who is working with labels such as Holic Trax and Static Audio, here he twists ‘Get You’ into a chunky and raw house workout. It’s out now.